The recent trend of home prices is clearly downward in most metropolitans markets. For Calgary December was a sixth straight month without an index rise, a cumulative decline of 2.0%; for Vancouver a fifth straight month and a cumulative loss of 2.9%; for Edmonton a fourth straight month and a cumulative loss of 2.7%. For Victoria, Winnipeg and Hamilton it was a third straight month, with cumulative losses of 0.5%, 1.6% and 1.0% respectively. The Halifax index was down 1.6% from five months ago, Quebec City and Toronto were down −0.8% and −0.2% respectively from four months ago. Only the Ottawa-Gatineau and Montreal indexes finished 2018 in strength, rising 7.9% and 4.8% respectively from March to December and both ending the year at all-time highs. While home values nationally have declined over the past three months, annual price growth has actually bounced back from its post-GFC low. In the year to December, Canadian home values rose by just 2.5%, up from the post-GFC low of 1.4% in August. 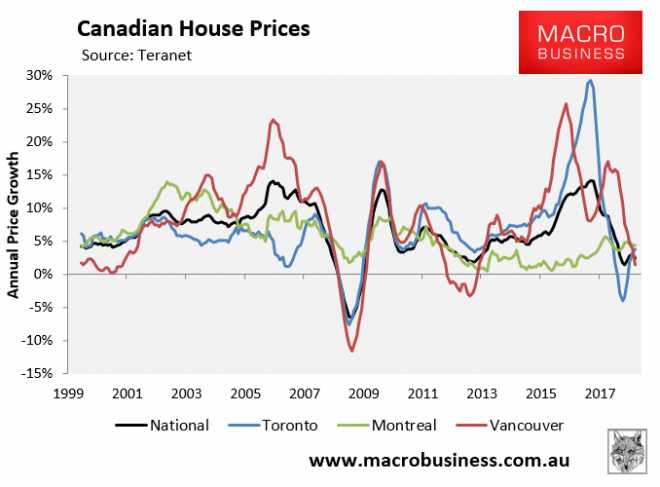 The rebound was driven by Toronto, whose annual price growth rebounded to 3.7% from -3.3% in August. 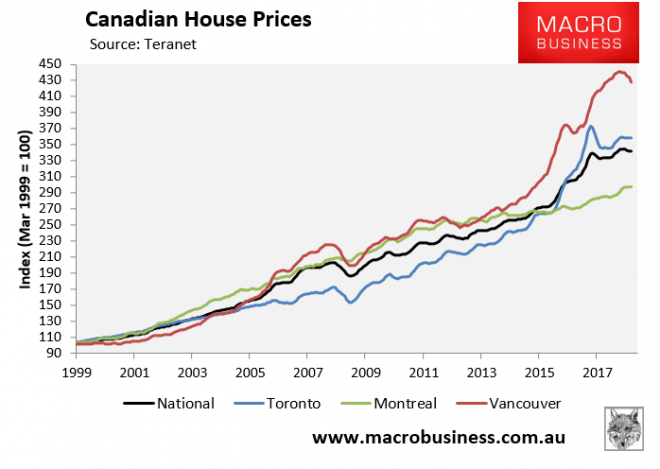 Elsewhere, annual price growth was 4.4% in Montreal but has faded to just 1.4% in Vancouver.